The Prairie Farmer Recreational Trail follows part of the former Chicago, Milwaukee, St. Paul and Pacific Railroad corridor, which traces its origins as far back as 1866. Its history lives on in Cresco, where you can view a restored Milwaukee Road diesel engine at Beadle Park (on State Route 9/Second Avenue, between Second Street and Elm Street) just over a half mile from the trailhead. Its history also lives on in Calmar, where a small interpretive loop explores signage from the Milwaukee Road era, and a historical rail depot (which houses an antiques store) greets travelers as they begin or end their journey. The trail makes its way through some of the last native prairie habitat of the region, with spectacular wildflower meadows and scattered woodland areas lining the pathway. There are also ample opportunities to see wildlife and a wide variety of birds. 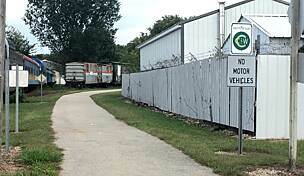 Start your journey in Cresco at Second Avenue SE/IA 9 and Eighth Street East, although be aware that there is limited parking at this trailhead. The path begins on a wide sidewalk and follows IA 9 to the edge of town. Note that additional parking is available at the access point at IA 9 and 345th Avenue, where the trail enters more of a tree-lined corridor paralleling the highway. 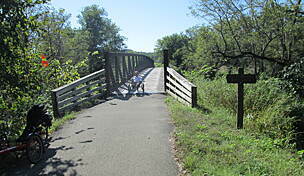 A little more than 8 miles in, you’ll reach the town of Ridgeway, where the trail shares a roadway through town. Sharrows are marked on the road but are a bit faded. Turn right onto Short Street and then left onto County Street Road. When you reach the edge of town, take a sharp left onto 295th Street where it meets with County Road W14. 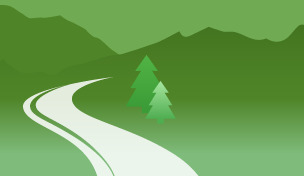 The short gravel road will take you back to the off-road portion of the trail at Ridgeway Roadside Park, where you’ll find a sheltered picnic area, a playground, water, parking, and pit toilets. The trail continues through a mostly wooded corridor. 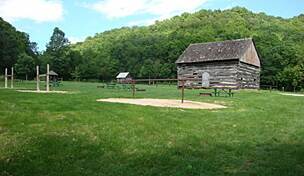 Just after the town of Conover, there’s a small interpretive loop with historical signage from the Milwaukee Road era. The loop provides a nice shaded rest area under the forested canopy. As you enter the town of Calmar, you’re greeted on your right side with the portion of the railway that remains in use. 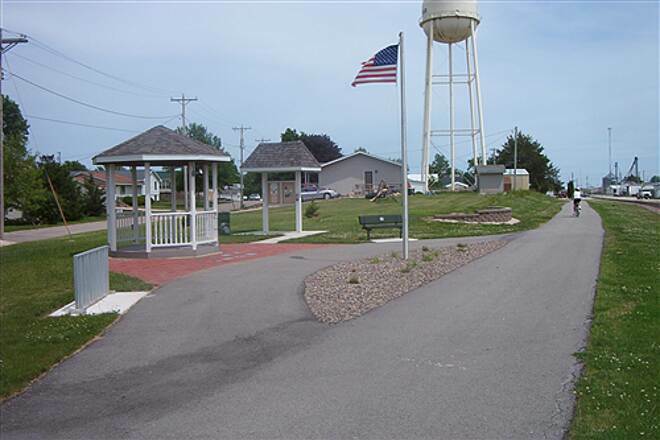 The trail passes through a small park that is home to the Winneshiek County Freedom Rock—a memorial to honor veterans and first responders. The memorial is a project of artist Ray Sorensen, who paints patriotic scenes on the stones and hopes to decorate one for each of Iowa’s counties. The park has plenty of parking, a gazebo, and benches. 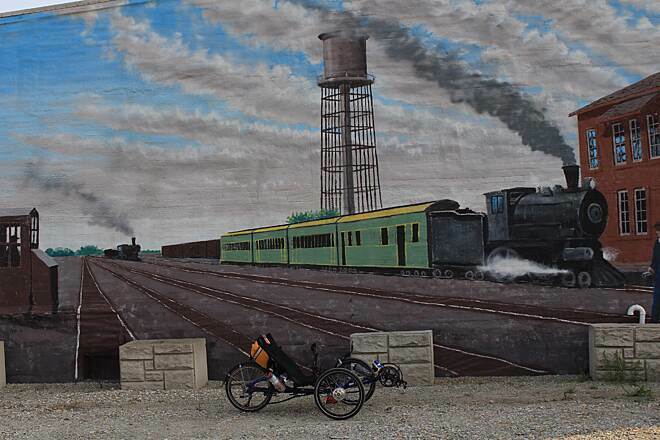 The trail ends at the restored train depot in Calmar. Inside the depot you’ll find a range of displays on the city’s railroad history as well as an antiques shop. 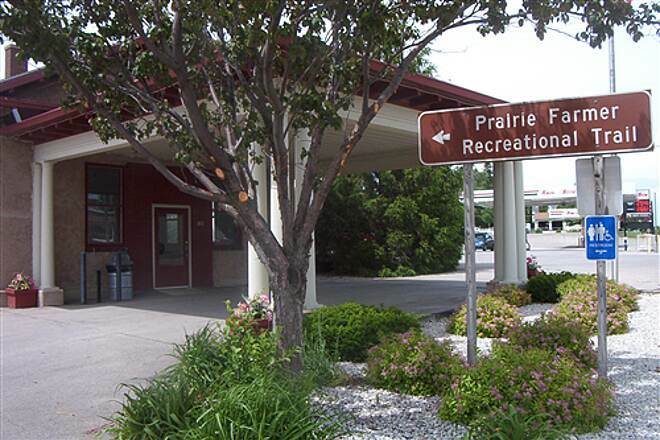 A public restroom is available on the south side of the building, and plenty of parking is available at the depot and on the streets in town. Calmar is also home to a handful large murals painted by local artist Carl Homstad; look for the painting of the old railroad along the railroad tracks near Maryville Street. To reach the northern trailhead in Cresco from Waterloo, take US 63 northbound for about 60 miles, and turn right onto IA 9. Go 9 miles to Cresco, and turn left into the trailhead parking lot just past Eighth St. E. Farther along SR 9, you can reach another small parking area at 345th Ave., after the highway makes a bend to the right. 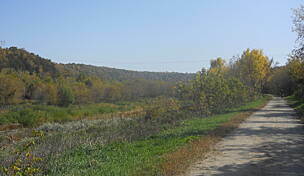 To reach the southern trailhead in Calmar from Waterloo, take US 63 northbound for 34 miles. Turn right onto 240th St., go 6.5 miles, and turn left onto Roanoke Ave. After 4 miles, turn right onto SR 24, and go about 20 miles. In Calmar, turn right onto Main St., go three blocks, and turn left onto Maryville St. The Calmar train depot will be on your left, just past the railroad tracks. Parking is available on the north side of the station, and street parking is available throughout the town. The trail begins 0.2 mile east at Maryville St. 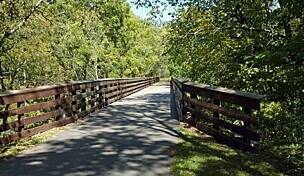 The Prairie Farmer trail is scenic, smooth, and in a convenient location for us to include on a weekend trip through Iowa. 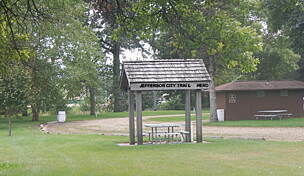 The Calmar trailhead has full facilities and was a great place to start the ride. There are few road crossings, very little grade, and a marked 1-mile detour through Ridgeway near the midpoint of the trail. The detour is on quiet local streets. There is a stretch that runs alongside a gravel road, and depending on the wind riders are enveloped in dust from the passing cars. Ridgeway also featured a picnic area and pit toilets, but those were not useable. 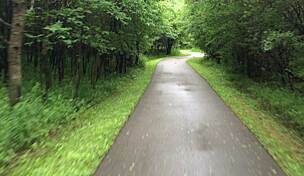 The trail turns alongside the highway into Cresco, where it becomes a sidewalk. We turned around at that point. This trail is now paved and it's very smooth. 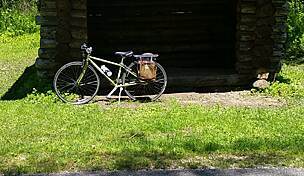 I started in Cresco where there isn't a clearly defined trailhead; heading eastward you ride on a wide concrete sidewalk for a mile or 2; then after turning south it turns into asphalt the rest of the way. Most of the way small trees & bushes shield you from the prairie winds; the scenery is pretty much farm buildings, fields & pasture. I passed only one other biker and a county guy spraying weeds who was very friendly. About half ways you go thru tiny Ridgeway on poorly marked streets; at the southern end of Ridgeway there is a nice trailhead (except the bathrooms are terrible). There are benches, parking & a water pump (which I didn't try). 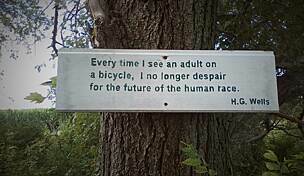 Onward towards Calmar & it's more of the same except for the last few miles which are a little hilly with more trees. The trailhead in Calmar is an old railroad depot. There's a "Mom & Pop" restaurant directly across the street from it (with many old photos displayed). Both Calmar & Cresco seem to have lots of older buildings & history worth investigating. 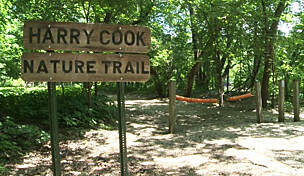 This trail is only 20 miles or so south of Harmony, MN with its famous "Harmony-Preston/Root River" trails; definately worth a side trip for something new. My wife and I had an opportunity to ride this trail on a hot, windy August Saturday. Traffic was very low, we were well buffered from the wind in most places and the trail was in excellent shape. * Great new asphalt surface. * Just enough cover to dampen the wind in an otherwise exposed area. 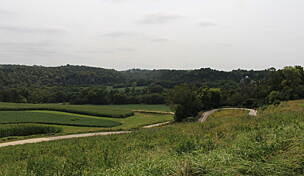 * Pretty Northeast IA countryside and farmland beyond trail. * More butterflies than I have seen on any trail. * Not crowded at all. * Lots of road noise between Cresco and Ridgeway. * Not enough mature cover for much wildlife. * Forced to the streets going through Ridgeway.